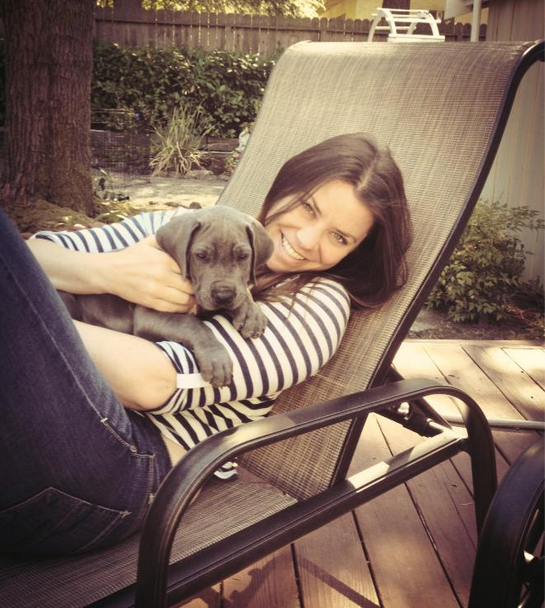 Brittany Maynard is 29 years old with only 24 days left to live. On November 1st, Brittany plans to die. And she has only 24 days left to live. On November 1st, Brittany plans to die. 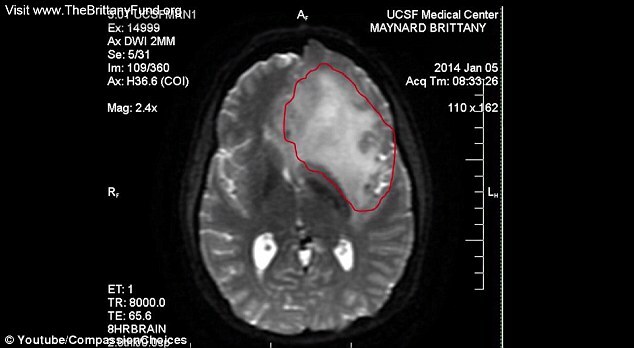 Brittany is suffering from stage 4 Brain Cancer. She was married late last year. Shortly after that she started having headaches. In January, doctors told her she had stage 2 Brain Cancer. They gave her 3-10 years to live. Doctors told her she now only had 6 months to live. Brittany was living in the Bay Area. 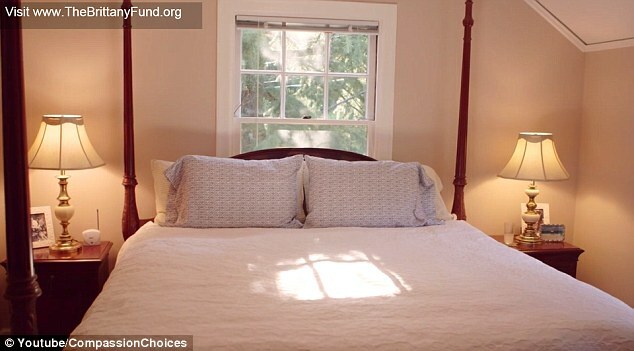 But after learning she was going to die soon, she and her family moved to Portland, Oregon. The reason: Oregon has a “Death with Dignity” law. That means Brittany can choose when to end her life, instead of suffering. She will use medication prescribed by her doctor. During her last days, Brittany has been traveling. She’s gone to Yellowstone Park and Alaska. She hopes to make it to the Grand Canyon, but time is running out. 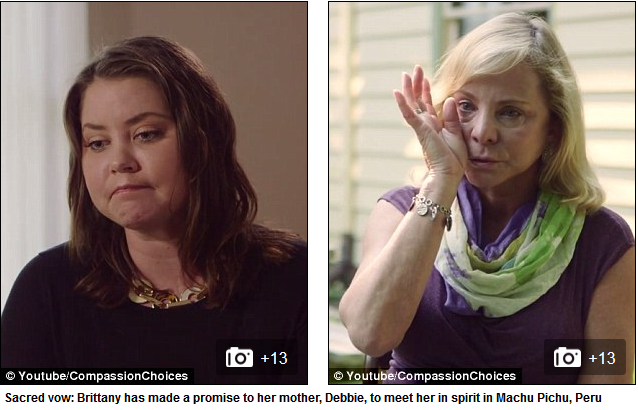 She also has made a deal with her mother, Debbie, that if she travels to Machu Pichu in Peru after her passing, Brittany’s spirit will meet her up there among the breathtaking Inca ruins. Brittany has made a video about her life and impending death. I broke down both times. But at the same time there is something so inspiring about her. She’s very matter of fact and very direct. “Make sure you’re not missing out. I’m going to write that down and put it on my desk at work. I want to see her words every day. And for the sake of this post, I will assume that if you want to hit “like” it means you have Brittany in your thoughts. God bless her and her family for standing beside her and respecting her choice. May she find peace and freedom from her painful struggle. There’s no cure ….. dying with dignity, in her own terms. Be blessed! I f*#king despise cancer! It took my mom 3 months ago! I saw her suffering and it ripped my insides out! If she wants to end it on her terms, it’s her choice alone. Tough stuff made both sad and beautiful. Thank you. And right now I have no opinion. Should I ever be in the same position – ask me then. She will be in my prayers as will her family. Thank you for sharing this!! I am for the freedom of choice! I just wish that she could really make the best of her days left. It must be hard on her family, but also sort of comforting that she will not be in pain anymore. God bless her soul, she is a reminder of how precious life is. It’s her choice, as it should be for everyone in these kinds of circumstances. Blessings to her and her loved ones. What an amazing woman. She is not falling apart but shines like the sun and comforts and encourages others. Her death mustn’t be in vain and therefore we should not wait until our time is running out with all of the insights she shares. Thank you! How so very devastating. What a strong young girl. My heart goes out to her and her family. read it. watch it. live it. Thank you, that’s an incredible piece. Many responses speak of “dying with dignity”. Although I understand this sentiment, one should realize that dignity is innate in the Image of God placed lovingly within and there is nothing, not even this horrific cancer, that could steal it from her. God Bless you Brittany. I don’t usually condone suicide, but as with all things in life, there are exceptions, and this is one of them. My father had a similar situation, but wound up doing the deed by himself. Whether it was because of the rapidity of his pending demise (literally, a matter of a few days) or not believing anyone would honor his decision. I can’t say if I could do it myself. I’m not in that situation. The calculus changes with your stage in life, I imagine. Thank you for Sharing, Carlos. I am wondering if Brittany or her family has ever heard of, or researched Stanislaus Burzynski in Texas? He uses anonplastons and has been the only dr. who has had success treating her particular disease, not only treating but reversing in some cases. It would be worth looking into. God Bless. The cancer society and the food and drug administration is probably in the way as usual! i believe that , only our God up above, who created her, has the right to end her life on earth. I do agree that she is suffering and can understand what she is going through,and it is easy for me to say this, but still, God is in control and will take care of Brittany. She has no right to end her life on earth. i would pray for her and ask God to help her and guide her according to his will in her life. She can choose when she dies and she has. Lucky for her she is in a place that allows this to be done with dignity. It is not for us to judge. I don’t know what to say to this. I absolutely understand her decision and I don’t judge it in the least. But somehow, it doesn’t bring me peace. I wish it did. I am glad it brings her peace, however, and that’s all that matters. Thanks for posting – an important topic to ponder. And thanks for following me on Cold. In the same way as yourself, this piece leaves me with no peace, questions and a degree of anxiety also. Hoping you are well and life is being kind to you and yours. Thank you for sharing . God Bless you Brittany . it was your choice , your life . Yes you have a right to decide for yourself . God Bless and May your soul rest in peace . There’s no better reason than life’s uncertainty to live it to the fullest every moment of every day. This is a heart-wrenching story about a courageous woman with a message that mirrors that thought. Thank you for sharing your thoughts and experiences, Ivan. Much appreciated. I am for the rite to choose when to terminate your suffering in the event of a terminal illness, because not only it is hard to see yourself “decaying” but even harder to see your loved ones seeing you suffering ! I admire people particular as young as Brittany who have the amazing courage to make such choice !! But unfortunately I’m not in a country that doesn’t support those rites nor am I in a financial position to move in a country that does, so if I where to be diagnosed with a stage 3/4 cancer I will definitely decline treatments such as chemotherapy and what I’ll be likely to do is called suicide !! No suggestions, Enza. However, perhaps, if such a situation arises, you could speak firstly with your doctor and friends and family. I totally support it for people with terminal illnesses. In some places I’ve heard it can be used for depression,.and I am NOT in favor of that. But my Aunt died of a glioblastoma. Not a happy way to die.